This article is over 2 years old. Proceed with caution. The article is based on QuickBooks API version 2, which has been depreciated by Intuit. I have new articles and screencasts based on the current API version 3. Part 1: Make an OAuth connection between a Rails 4 app & QBO. Part 2: Create a Vendor on both Rails app and QBO. Part 3: Disconnecting from QBO. Part 4: Implementing Single Sign On. Part 3: Disconnect the Rails app from QB0. Simple disconnect link to get the ball rolling. We'll come back later and add the href target. DISCUSSION: We need a disconnect action but the vendors_controller is getting crowded, therefore, let's create the quickbooks_controller. This is also a perfect place for the authenticate and oauth_callback actions so we are going to move them before creating the disconnect action. Make a new quickbooks_controller and move the authenticate and oauth_callback actions from the vendors_controller to here. The new controller at app/controllers/quickbooks_controller.rb should look like the code below. Notice the highlighted sections that also need to be modified. flash.notice = "Your QuickBooks account has been successfully linked." Then modify the following line in app/views/layouts/application.html.erb to reflect the new authenticate route. Finally, make sure you issue a touch tmp/restart.txt to restart the app as the routes have changed. DISCUSSION: We are still not done with the refactoring. The disconnect action uses a different Quickeebooks service then from the one used in the vendors controller so let's make the set_qb_service method more flexibility. Allow set_qb_service to create additional services. # Prevent CSRF attacks by raising an exception. # For APIs, you may want to use :null_session instead. 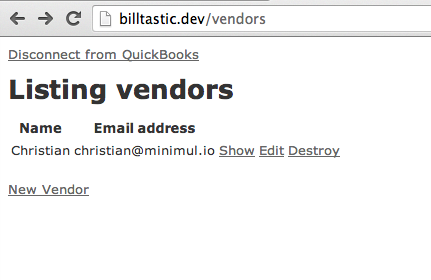 Reload billtastic.dev/vendors to test that the refactorings have taken effect with no errors. DISCUSSION: The disconnect action uses the AccessToken module/service from Quickeebooks. It provides a disconnect instance method that makes an API call requesting the disconnect. Intuit states that an error_code of 0 indicates a successful request but I have found that an error_code of '22' worked fine and the connection was properly disconnected. The session's are cleared in all cases because even on a disconnect failure this indicates that the current credentials are invalid and creating a new connection may be the solution. IMPORTANT: There are many points were the Intuit v2 API doesn't work exactly as stated in the docs as in the above example were I received an error code of '22' but the disconnect worked fine. Don't beat yourself up because you are not obtaining responses precisely as described in the documentation. Just shrug your shoulders and move on. Before we test disconnecting, let's log into the Intuit Partner Platform like we did in Part 1. From there navigate to My Apps->Manage My Apps and then to the Billtastic app. We will use this view to confirm that we successfully disconnected. While we are here let's also change the disconnect url to billtastic.dev/quickbooks/disconnect. NOTE: This url change is not needed for this tutorial and is only used for when a disconnect action is initiated from the Intuit App Center. We want to make the change now while we are here and the new disconnect route is fresh in our minds. 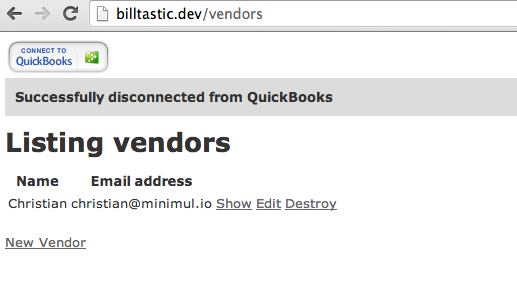 Let's go back to the Billtastic.app at billtastic.dev/vendors and click on the 'Disconnect from QuickBooks' link. Click thru the confirmation dialog. The 'Connect to QuickBooks' button also correctly displays now that the session[:token] is nil. Let's make sure the disconnect occurred by checking over at the Intuit Partner Platform. Ok, that confirms it. There was 1 connection last time we checked (see Fig. 2). Stay tuned to Part 4 in where I will hook up the Billtastic app with the ability to use your Intuit QBO credentials to sign on. This is referred to as "Single Sign On" by Intuit and is needed if you desire to have your application listed on their App Center. 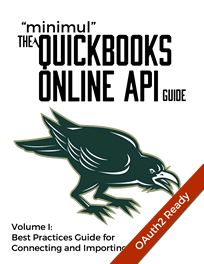 Get the QuickBooks Online Integration book. No clue how to get starting with a QuickBooks Desktop Integration? Sign up for the Master Class. Sign up for the QuickBooks Integration Roadmapping Call! Don't know where to start on a QuickBooks Integration. I'll get you on solid ground, fast! 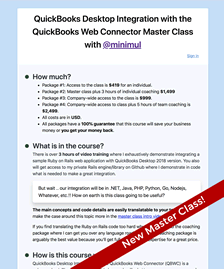 QuickBooks Desktop Integration Master Class Is Here! Does Intuit require OpenID for QuickBooks Online integration? Tired of features being put on hold while your team burns time on QuickBooks integration? Contact me. I have been there, done that, when it comes to QB integration. 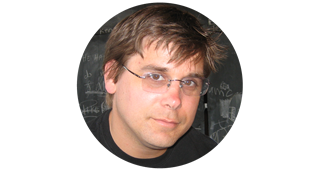 Christian Pelczarski, a.k.a Minimul, a QuickBooks Integration Expert. My home base is near Keene, New Hampshire. I help businesses realize greater profits through a successful and reliable QuickBooks integration. I am available for hire, contact me.